Everyone researches their options in various ways, and when it comes time to find an ecommerce solution, the process of comparing your options isn’t any different. Some people may prefer to read expert reviews, while others might want to browse comparison charts to see how different ecommerce solutions stack up side by side. At ZippyCart, we provide a variety of comparison tools including charts that compare the top 10 shopping carts of the year, the top carts of all time, and even charts that compare any shopping cart of your choice, to any other cart side by side. Compare the top 10 ecommerce solutions of 2011 side by side. If you’re interested in a hosted shopping cart solution, compare the best hosted shopping carts of all time side by side. If you want to own your ecommerce software outright, consider one of these top licensed ecommerce solutions compared side by side. If your priority is bandwidth, price, disk space, etc., checkout this resource that lets you sort ecommerce solutions by these important numbers. via New to Ecommerce | Are You New to Ecommerce and Need Some Help Starting an Online Store? ZippyCart is Here to Help..
Brands can bring the Facebook experience to their websites, tapping usersâ€™ connections and interests to support the purchasing process. The simplest examples involve using social plugins â€” short code snippets that ping Facebookâ€™s network for information about the user visiting the brandâ€™s site. The Like Button is the most common plugin and is usually regarded as a content sharing device, but when it is used in conjunction with a product page it can provide peer support by displaying the names and profile images of people who have Liked the product â€” most appealing for brands is the fact that it also highlights any of the userâ€™s Facebook friends who have Liked the product. A more sophisticated approach uses Facebookâ€™s Open Graph API to retrieve the Likes and interests of the user, as well as those of his or her friends. There is a permission screen involved and every friendâ€™s privacy settings are individually respected. For the past few months Amazon.com has been offering a â€œTap into Your Friendsâ€ option (still labeled Beta). 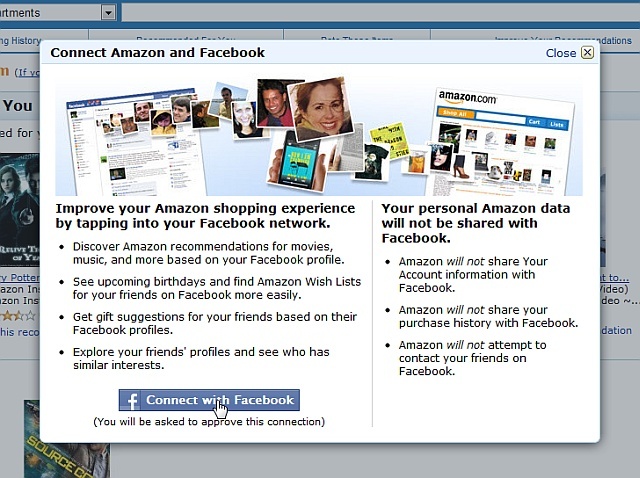 After the permission screen, the user is taken to an Amazon page showing the upcoming birthdays of Facebook Friends and their Amazon Wish List if they have one. Amazon uses a userâ€™s friendsâ€™ profile data, which often includes favorite books and music, to make gift suggestions. Business accounts can set up a storefront for free on their Facebook Pages, and many thousands have already done so. The vast majority start the shopping process at Facebook.com but then jump to their own ecommerce pages at some point. 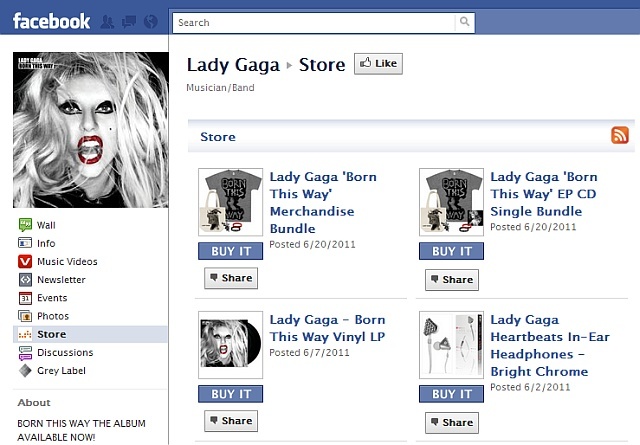 Lady Gagaâ€™s Facebook store is an example of a store that takes users on a rather abrupt transition. Users can browse products on her Facebook Page, but any click takes them to the product page at bravadousa.com, a licensed merchandise marketer and fulfillment service. The Facebook branding is gone, and the look and feel changes completely. A new window opens which would make any Facebook multitasking (e.g., chat) cumbersome. Apparently, a Page with over 30 million Likes can get away with this â€” Justin Bieber has the exact same arrangement. Best Buy keeps shoppers in the Facebook environment a bit longer and takes advantage of the social features while they are there. Its store app isnâ€™t labeled â€œShop,â€ it is â€œShop + Share.â€ Users can search or browse for products, and when they find something that interests them, they have two options: â€œAsk Friendsâ€ or â€œShop Now.â€ â€œAsk Friendsâ€ leads to a Wall post asking about the product. Interestingly, Best Buy currently makes â€œAsk Friendsâ€ much more noticeable than â€œShop Now,â€ which takes the user to the product page at BestBuy.com for the shopping cart and checkout process. 1-800-Flowers has pioneered a selling process that never takes the user away from Facebook.com. Shoppers can select products, options, see delivery dates and even include a personal message without interrupting their Facebook experience. 1-800-Flowers does not take full advantage of the social environment, though, as it doesnâ€™t provide an easy way to ask a relative what Momâ€™s favorite flowers are or what her zip code is, for example. 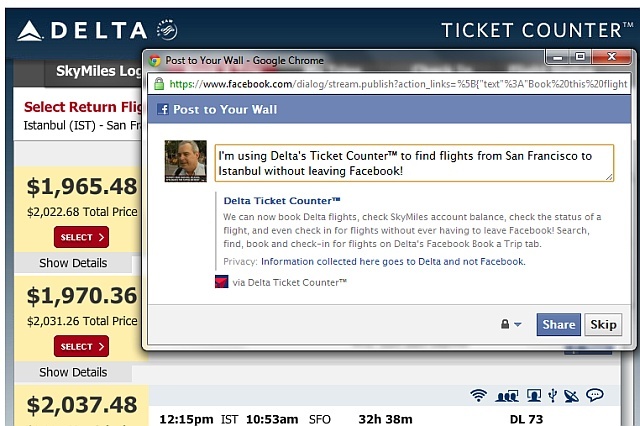 Delta Airlines has built a complete ticketing system into its Facebook Page, and while it allows the user to promote Delta by posting a general message on his or her Wall, it doesnâ€™t do much to help the user share details with Friends involved in the trip, something that a Send Button could do nicely. There are two ways of displaying F-commerce Pages on Facebook.com, each with its pluses and minuses. In February 2011, Facebook adopted iFrames as the method that businesses use to supply custom content to their Pages. In the simplest terms, iFrames allow a business to create and host its own content and to display it in the 520-pixel middle column of a Facebook Page. Lady Gaga, Justin Bieber and even Best Buy, present their F-commerce pages through an iFrame. The advantage is simplicity, since businesses can create and maintain the content on their own terms â€” iFrames tend to offer the most seamless experiences for consumers. 1-800-Flowers and Delta do their selling via Facebook apps. The primary advantage of going to an app is real estate. iFrame content is restricted to the 520 pixel-wide middle Page column, while an app can control the left most 760 pixels â€” a 46% increase in visible selling space. The disadvantage of apps is that they are more difficult to maintain and they may stress smaller budgets within businesses lacking Facebook development expertise. The list of software developers offering F-commerce products is growing. Many come from traditional ecommerce, offering Facebook as an extension for their clients. SortPrice, for example, powers the Dallas Mavericksâ€˜s Facebook store, and Usablenet, which powers JCPenneyâ€˜s Facebook store. 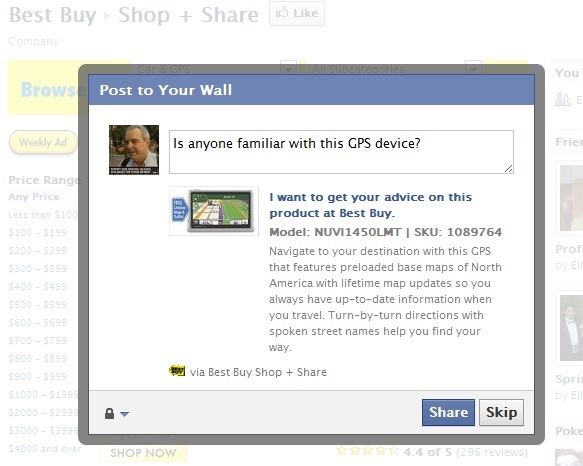 Another popular application for adding Facebook to an existing ecommerce program is Storefront Social, which Borders uses. A popular developer that seems to be emphasizing F-Commerce is 8thBridge, responsible for 1-800-Flowers, as well as Delta. And the popular Payvment app allows clients to become part of a Facebook shopping mall with a connected shopping cart. There are many more questions than there are answers about the long term future of F-commerce, which is still in its infancy and barely survived its birth. In 2007, Facebook tried Project Beacon, which collected ecommerce activity on third party sites and announced a userâ€™s purchases on his or her friendsâ€™ news feed. Facebook quickly withdrew from that privacy nightmare but its dismal reputation for freely dispersing user data still haunts F-commerce. Many Facebook users have become so accustomed to Facebookâ€™s aggressive data sharing policies that they automatically assume the worst. A recent study from JWT found the percentage of people worried about Facebook privacy and security to be in the 75% range. Experienced ecommerce managers also see problems with Facebook.com itself. â€œThe user experience is less-than-optimal with slow page loads and smaller page size due to Facebookâ€™s advertising and navigation. I donâ€™t see why customers would bother shopping through Facebook when a faster and better experience is only a browser tab away,â€ notes Linda Bustos, director of ecommerce research at Elastic Path Software. Facebook advertising is certainly an issue. No matter how you structure your F-commerce store, the user will still be served targeted Facebook ads during the buying process. Many web marketers question the social nature of shopping itself, and there is considerable opinion that people visit Facebook to catch up with their Friends and not to be sold products. The good news on that front, from the JWT study, is that 48% of millennials (aged 20-33) would like to see the places where they shop give them the ability to buy directly on Facebook. The best reason for businesses to take a deep breath before investing in a F-commerce is Facebook itself, which currently benefits from F-commerce primarily through the sale of ads promoting it. Theyâ€™d obviously like a better cut and nobody is quite sure how they would do it. Facebook Credits could somehow be expanded to become the currency for F-commerce. Credits for gaming and virtual goods earn Facebook a 30% commission â€” F-commerce Credits would probably be in the 5% range. There is no shortage of opinions regarding the future of selling on Facebook, but one overwhelming motivation â€” it is where the customers are, and they should be able to buy wherever and whenever they like. Market and sell your products quick and easy with our state of the art e-commerce solution. Unlike your average shopping cart software, 3DCart can integrate into your current design in just minutes! We can import your existing design, products, and site content for you. Migrate from Yahoo Stores, Miva, X-Cart, and just about every other shopping cart. We even provide FREE tips and support while you migrate your current web site to 3DCart! Shopping Carts from 3DCart include category, product, and customer management tools not found in many of our competitor products. Click here to view the complete set of features. Accept credit cards, checks, etc. PrestaShop is the first E-Commerce project to be granted the Open-Source Award. Discover 65 new features in PrestaShop version 1.4, making in total over 265 features! This exceptional wealth of features enables you to create a comprehensive e-commerce site, personalized to fit your needs. Choose a fast, complete, and modifiable e-commerce solution! + 50,000 Sites created with PrestaShop ! By choosing PrestaShop, you are guaranteed to be accompanied by many major agents of e-commerce already integrated into the software: La Poste, PayPal, Moneybookers, etc. You can benefit from their 50,000 stores operating around the world, including such prominent names as Centre Pompidou, Peugeot Sport, Mercedes-Benz, Tartine & Chocolat, and many more! Join the community and you too can enjoy all of the advantages of PrestaShop! Use our Demo to test-drive the PrestaShopâ„¢ e-Commerce Solution. In our Live Shops section, check out some of our client Websites. Updated regularly! Check out our new video to discover the PrestaShop software and our services. via PrestaShop Free Open-Source e-Commerce Software for Web 2.0. Zero complexity. Lower development costs. Shorter time-to-value. via Build Custom Apps for your Business: Zoho Creator. Youâ€™ve seen what Woot has done with the power of daily deals. Now you can ignite your eâ€“commerce site with your very own Deal of the Day. Speed: Saving you time is our number one goal. We know you’re busy, we all are; thatâ€™s why we made Dealy as simple as possible. Create your deals with just a couple clicks and you’re done. Scheduling: No need racking your brain trying to remember yet another task; you can create all of your campaigns at once and schedule them to run throughout the week, month, year, whenever. Tracking: So, how are your deals doing? We provide live statistics on each of your deals which you can check up on at any time. Networking: Whatâ€™s the best way to give your deals traction? Word-of-mouth of course. Thatâ€™s why we let you post to all of the popular social outlets at once. Let your customers do your advertising for you. via Daily Deal Software for E-commerce Sites | Dealy. 1. Nine Step Guide to Success – Everything you need to know. 2. 10 tips to ramp up sales toward holiday seasons. via Articles in Ecommerce School – Ashop Commerce. â€¢ Î£Ï‡ÎµÎ´Î¯Î±ÏƒÎ· ÎºÎ±Î¹ ÎºÎ±Ï„Î±ÏƒÎºÎµÏ…Î® Î¹ÏƒÏ„Î¿ÏƒÎµÎ»Î¯Î´Î±Ï‚ (website) ÏƒÎµ Î³Î»ÏŽÏƒÏƒÎ± Ï€ÏÎ¿Î³ÏÎ±Î¼Î¼Î±Ï„Î¹ÏƒÎ¼Î¿Ï PHP Î¼Îµ ÎºÎµÎ¯Î¼ÎµÎ½Î±, Ï†Ï‰Ï„Î¿Î³ÏÎ±Ï†Î¯ÎµÏ‚, ÎºÎ±Î»Î¬Î¸Î¹ Î±Î³Î¿ÏÏŽÎ½ ÎºÎ±Î¹ Î´Ï…Î½Î±Ï„ÏŒÏ„Î·Ï„Î± ÏƒÏÎ½Î´ÎµÏƒÎ·Ï‚ Î¼Îµ Ï€Î¹ÏƒÏ„Ï‰Ï„Î¹ÎºÎ­Ï‚ ÎºÎ¬ÏÏ„ÎµÏ‚. â€¢ Î”Î¹Î±Ï‡ÎµÎ¯ÏÎ¹ÏƒÎ· Ï„Î¿Ï… Î·Î»ÎµÎºÏ„ÏÎ¿Î½Î¹ÎºÎ¿Ï ÎºÎ±Ï„Î±ÏƒÏ„Î®Î¼Î±Ï„Î¿Ï‚ (Î±Î»Î»Î±Î³Î­Ï‚ – Ï€ÏÎ¿ÏƒÎ¸Î®ÎºÎµÏ‚) Î±Ï€ÏŒ Ï„Î¿Î½ Î¯Î´Î¹Î¿ Ï„Î¿Î½ Ï€ÎµÎ»Î¬Ï„Î·. â€¢ Î”Î·Î¼Î¹Î¿Ï…ÏÎ³Î¯Î± link Î¼Îµ site ÏƒÏ…Î½ÎµÏÎ³Î±Î¶ÏŒÎ¼ÎµÎ½Ï‰Î½ ÎµÏ„Î±Î¹ÏÎµÎ¹ÏŽÎ½ ÏƒÏ„Î·Î½ Î•Î»Î»Î¬Î´Î± ÎºÎ±Î¹ Ï„Î¿ ÎµÎ¾Ï‰Ï„ÎµÏÎ¹ÎºÏŒ. â€¢ Î”Î·Î¼Î¹Î¿Ï…ÏÎ³Î¯Î± mail form Î³Î¹Î± Î±Ï€ÎµÏ…Î¸ÎµÎ¯Î±Ï‚ ÎµÏ€Î¹ÎºÎ¿Î¹Î½Ï‰Î½Î¯Î± Î¼Îµ Ï„Î¿Ï…Ï‚ ÎµÏ€Î¹ÏƒÎºÎ­Ï€Ï„ÎµÏ‚ Ï„Î·Ï‚ Î¹ÏƒÏ„Î¿ÏƒÎµÎ»Î¯Î´Î±Ï‚ (website) ÏƒÎ±Ï‚. â€¢ Î”Ï‰ÏÎµÎ¬Î½ ÎµÎºÏ€Î±Î¯Î´ÎµÏ…ÏƒÎ· ÎµÎ¾Î®Î½Ï„Î± Î»ÎµÏ€Ï„ÏŽÎ½ ÏƒÏ„Î· Ï‡ÏÎ®ÏƒÎ· Ï„Î¿Ï… Î·Î»ÎµÎºÏ„ÏÎ¿Î½Î¹ÎºÎ¿Ï ÎºÎ±Ï„Î±ÏƒÏ„Î®Î¼Î±Ï„Î¿Ï‚. â€¢ Î•Ï€Î¯ÏƒÎ·Ï‚ ÏƒÎ±Ï‚ Ï€Î±ÏÎ­Ï‡ÎµÏ„Î±Î¹ Î· Î´Ï…Î½Î±Ï„ÏŒÏ„Î·Ï„Î± ÎºÎ±Ï„Î±ÏƒÎºÎµÏ…Î®Ï‚ ÎµÎ½Ï„Ï…Ï€Ï‰ÏƒÎ¹Î±ÎºÎ®Ï‚ ÎµÎ¹ÏƒÎ±Î³Ï‰Î³Î®Ï‚ ÏƒÎµ Ï„ÎµÏ‡Î½Î¿Î»Î¿Î³Î¯Î± FLASH Î¼Îµ ÎµÏ€Î¹Ï€Î»Î­Î¿Î½ ÎµÏ€Î¹Î²Î¬ÏÏ…Î½ÏƒÎ· Î¼ÏŒÎ½Î¿ 150 ÎµÏ…ÏÏŽ. â€¢ Î ÏÎ¿ÏŽÎ¸Î·ÏƒÎ· Î¹ÏƒÏ„Î¿ÏƒÎµÎ»Î¯Î´Î±Ï‚ ÏƒÎµ Î¼Î·Ï‡Î±Î½Î­Ï‚ Î±Î½Î±Î¶Î®Ï„Î·ÏƒÎ·Ï‚ ÎºÎ±Î¹ ÎµÏ€Î±Î³Î³ÎµÎ»Î¼Î±Ï„Î¹ÎºÎ¿ÏÏ‚ ÎºÎ±Ï„Î±Î»ÏŒÎ³Î¿Ï…Ï‚ (Ï€ÎµÏÎ¯Ï€Î¿Ï… 100) ÏƒÏ„Î·Î½ Î•Î»Î»Î¬Î´Î± ÎºÎ±Î¹ Ï„Î¿ ÎµÎ¾Ï‰Ï„ÎµÏÎ¹ÎºÏŒ. â€¢ Î¦Î¹Î»Î¿Î¾ÎµÎ½Î¯Î± Î¹ÏƒÏ„Î¿ÏƒÎµÎ»Î¯Î´Î±Ï‚ ÏƒÎµ Ï‡ÏŽÏÎ¿ 200ÎœÎ’ Î¼Îµ 100 Î»Î¿Î³Î±ÏÎ¹Î±ÏƒÎ¼Î¿ÏÏ‚ email (POP3) Ï‡Ï‰ÏÎ¯Ï‚ Î¼Î·Î½Î¹Î±Î¯Î¿ Î® ÎµÏ„Î®ÏƒÎ¹Î¿ ÏŒÏÎ¹Î¿ ÎµÏ€Î¹ÏƒÎºÎµÏ€Ï„ÏŽÎ½. â€¢ Î£Ï„Î±Ï„Î¹ÏƒÏ„Î¹ÎºÎ¬ ÏƒÏ„Î¿Î¹Ï‡ÎµÎ¯Î± ÎµÏ€Î¹ÏƒÎºÎµÏˆÎ¹Î¼ÏŒÏ„Î·Ï„Î±Ï‚ Ï€Î»Î®ÏÏ‰Ï‚ Î±Î½Î±Î»Ï…Î¼Î­Î½Î± Î´Î¹Î±Î¸Î­ÏƒÎ¹Î¼Î± 24/24h Î¼Î­ÏƒÏ‰ Internet. â€¢ Î¤ÎµÏ‡Î½Î¹ÎºÎ® Ï…Ï€Î¿ÏƒÏ„Î®ÏÎ¹Î¾Î· ÏƒÎµ ÏŒÏ„Î¹ Î±Ï†Î¿ÏÎ¬ Ï„Î·Î½ Î¹ÏƒÏ„Î¿ÏƒÎµÎ»Î¯Î´Î± ÏƒÎ±Ï‚ Î±Ï€ÏŒ Ï„Î¿ Ï„Î¼Î®Î¼Î± ÎµÎ¾Ï…Ï€Î·ÏÎ­Ï„Î·ÏƒÎ·Ï‚ Ï€ÎµÎ»Î±Ï„ÏŽÎ½ Ï„Î·Ï‚ Aboutnet. Sell on Facebook and Ebay, get found on Google, sell on iPhones and send automated email using iContact. Does your shopping cart do that? via Ecommerce Software & Shopping Cart Software Solutions by BigCommerce. Through the use of HTML, jQuery, AJAX, PHP core, XML, XSL and CSS Easy Basket has become a true two part application. A developer can easily switch between ASP or PHP core with no change to the designer mark-up, a designer has complete control over the look and feel of their basket through the use of skins. Easy Basket works on any web platform simply copy to your websites public root. As all calls to the core are via AJAX you can have access to Paypal and Google Checkout on any type of webpage be it HTML ASP NET PHP… please visit the installation page for three easy steps to install your free ajax Shopping Cart. Easy Basket is now available for download, feel free to download and try out in your projects, if you find Easy Basket useful please link back to easybasket.co.uk. The basket that is located in the the nav bar uses Div’s for layout CSS for look and feel and jQuery for the animation effects. via Easy Basket Free AJAX Shopping Cart with Paypal & Google Checkout.